hand-crafted vessels using traditional techniques. I specialize, but are not limited to,traditional designs chosen from the classics of the 19th and early 20th centuries, reminiscent of a simpler time of natural beauty. Only the finest quality hardwoods are used, including white oak, a variety of cedars, mahogany and larch. Each wood is chosen for the unique properties it lends to the strength, stability, longevity, speed or beauty of the vessel. 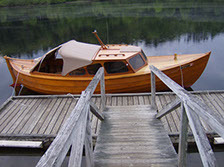 Traditional Boatworks will accept commissions for almost any traditional or historical design up to 40 feet in length. 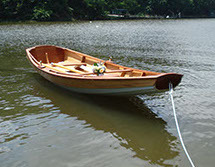 A classic design steeped in Scandinavian tradition, the Snekke is the newest custom-made, hand-crafted wooden launch offered by Traditional Boatworks. Using time-honored skills and only the most exquisite materials, each Snekke is built by hand to last for generations. My version of a slightly modified Rangely Guide Boat. 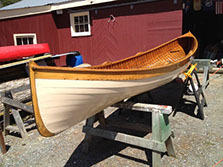 I added 3/4" of rocker to the keel for easy steering and gave it a little more sheer making this boat an elegant version of a classic small craft.